A two judge Bench comprising Justice B.S Chauhan and Justice S.A.Bobde of the Supreme Court has used unusually strong words while dealing with certain observations of another two judge bench of the same court which was deciding a similar issue. The jurists and lawyers point out that such language in the judgment is used only when a superior court deals with a judgment of a subordinate court or a larger bench deals with a bench of lesser strength, but definitely not by a bench of the same court with equal strength. The said order which has become a topic of discussion among lawyers has been passed in a writ petition filed by one Gurvail Singh against State of Punjab (Writ Petition (CRL.) NO. D.8788 OF 2013) for direction to convert the sentence of the petitioner from 30 years in jail without remission to a sentence of life imprisonment; and further to declare that the Supreme Court is not competent to fix a particular number of years (with or without remission) when it commutes the death sentence to life imprisonment, while upholding the conviction of the accused under Section 302 of Indian Penal Code, 1860. 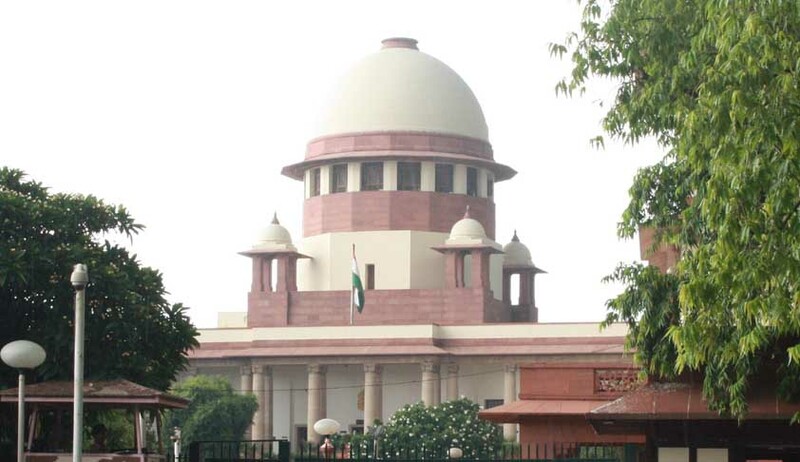 Earlier, another bench of the Supreme Court, in an appeal filed by the writ petitioner Gurvail Singh, against his death penalty, had converted his death sentence into life imprisonment with a direction that the petitioner shall serve 30 years in jail without remission. That decision is reported in Gurvail Singh @ Gala & Anr. v. State of Punjab (2013) 2 SCC 713. It appears that the present two judge Bench is provoked by the observations made by another two judge bench in Sangeet & Anr. v. State of Haryana (2013) 2 SCC 452, wherein a two Judge Bench, while dealing with the issue, had made observations to the effect that giving a sentence in a capital offence of 20 years or 30 years imprisonment without remission, tantamounts to effectively injuncting the appropriate Government from exercising its power of remission for the specified period. The decision of the Hon’ble Court in ‘Sangeet case’, has in fact already been considered by the Supreme Court in Sahib Hussain @ Sahib Jan v. State of Rajasthan 2013 (6) SCALE 219 wherein the Court had held that ‘in the light of the detailed discussion by the larger Bench, we are of the view that the observations made in Sangeet’s case (supra) are not warranted’. Fali Nariman has proposed that decisions of two judge Bench should not be considered law for the purpose of Article 141 of the Constitution and the same should be given a serious consideration. According to 141, the law declared by the Supreme Court shall be binding on all courts within the territory of India. A close examination of many judgments of the Supreme Court shows that there are many conflicting views expressed by judges in different combinations, and many such cases are pending for resolution before the Constitution Bench of the Supreme Court. Since the Constitution Bench requires a minimum of five judges, the Bench is constituted only on few occasions, owing to the large pendency of matters in the Supreme Court.